You will be making a one-way journey from the High Peaks of the Adirondack mountains all the way to the bright lights of the Big Apple. It really does not get more varied than that. There is far too much to say about New York State here, but we will say that this route is a snapshot of America in all her Glory – mountains, river, forests, farmland, old-skool kitsch, classic roadside Americana, history pumping from every corner of the route. And a terminus in the city that never sleeps. To traverse the route is to really embed yourself in the fabric of America: The Hudson is the backdrop against much of which has forged this Nation and a journey down this majestic river is as much about the river and the surroundings as it is the very heart of America. It’s enough to bring a tear to your Eye. And it will – that slug up Marcy may well that for ya! The route will deliver. Of that we have no doubt. On the logistics, safety and event management, Rat Race will deliver. We have been doing so Worldwide for a generation. In terms of how hard this is? Well, our guidance here will help you determine that. But this is a journey as much as it is a physical challenge. We want you to come out the back of this riding high, not beaten to a pulp never to run, ride or kayak again. It is tough, make no bones about that. But this really is one of those Bucket List trips that will make an impression for your entire life. Sounds a bit cheesey but there are some things that just do that; this is one of them. We mean it. it can be fairly pleasant upstate and in the city at this time of year. Equally it can get wet and windy, especially in the mountains. Our mandatory kit list will let you know what clothing you need but if the seasonal averages are in check, this will be warm, sunny sometimes, cloudy other times. Not too hot; not too cool. Really quite pleasant. OK lets state this here: In the mountains, there are bears. Black bears. They are shy and will not cause you any trouble. We will issue some sensible guidance but folks trek these peaks all the time and it is almost always trouble-free from bears. There’s other interesting critters out there too – such as bobcat, blue jay, eastern chipmunk, gray squirrel, osprey, mink, river otter, raccoon, striped skunk and beaver. If you are really lucky and gazing skyward, you may even see the mighty Bald Eagle. There’s a lot to mention over 300 miles. Bagging the High Point of the State has got to be a highlight – in fact you get double value as you will bag the source of the Hudson AND the high point of the State, all within 2 miles of one another! Make sure you check out Lake George as you pass through – it’s a charming town justifiably popular with tourists. As you wind your way further south the river valley is dotted with pretty villages including the town of Hudson itself, where we will overnight after the second day. We also pass through lovely Rhinebeck and other gems set right on the river and on the bluffs along its banks. As you approach Poughkeepsie you will also pass Roosevelt’s house and the Vanderbilt Mansion, both side by side on the riverside and both very impressive parts of the historical fabric of the nation. Coming closer into the city, the Pallisades Park in Jersey is a stunning and very unexpected way to reach the urban area –being green, lush, right on the river and virtually traffic-free. This thin belt of parkland offers up superb views of the GW bridge before reaching the bike terminus in the shadow of the bridge. On foot in the city, everything around you is iconic! 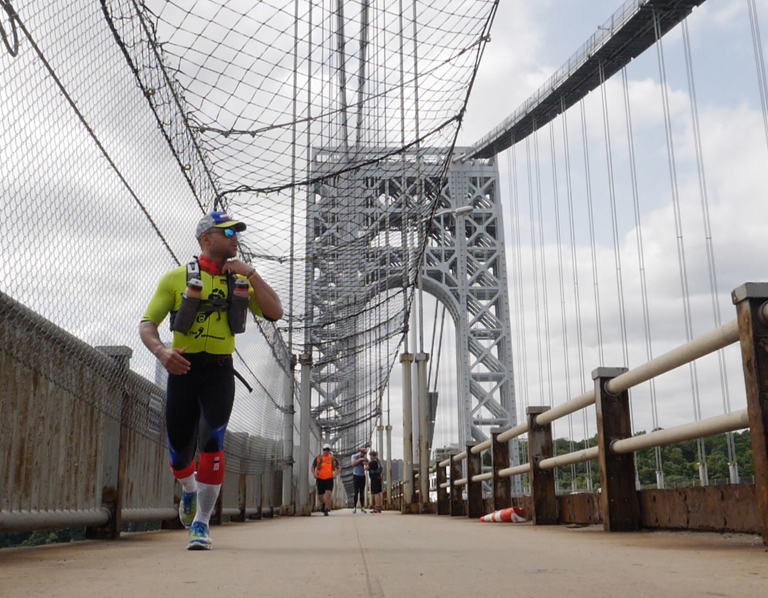 The GW bridge itself is a behemoth and very exhilarating to run across. The thin strip of park that hugs the Hudson riverbank through the city offers up the full gambit of New York City: Views of skyscrapers, boats on the river, helicopters buzzing, streetlife, folk going about their daily commute, cyclists, bladers, strollers. You will also run past such attractions as the amazing USS Enterprise floating aircraft carrier museum, all the way to the very belly of the Beast – Battery Park. From there you are surrounded by icons, including the Statue of Liberty, standing guard out there in the mouth of the Hudson herself.